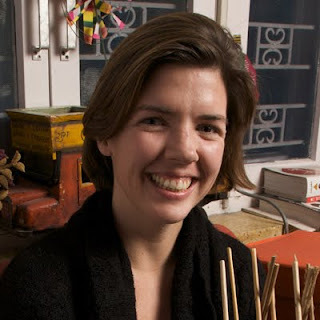 First of the series of interviews with TED India Fellows is the one with Lisa Heydlauff. For Lisa Heydlauff, her book “Going To School In India” was just the beginning. She is the Director & Founder of Going to school, a nonprofit trust which encourages children to go to school by passing on the message that “school can be fun”. The most recent recognition for her work is she being chosen as a TED Fellow. It’s only appropriate that the starting question should be, how it all began? Could you share with us the event(s) that shaped or touched your life, which led you to take this wonderful road? In the beginning, I came to India for the first time because of a story. In fact, it was a story that I did not checkout of a library, I remember that the title of the book was Women, the Press & Partition, but nothing more – I thought ‘in India words must come alive’ then there was a question from Oliver, age seven, who asked me, his teacher, hoping that I just might know, “What is it like to go to school in India?” I promised Oliver that if I ever did go to India I would find out. Give us a brief idea about your own childhood and educational background? My story moves between continents. Because I moved from school to school when I was young, and I was always the new child in school, I find my home in what I do: Going to School makes magical media (movies, books, radio) for children in India to inspire them to change their lives by going to school, just as I hoped and believed was possible when I was young. I’m sure Oliver got an answer to his question in that book “Going to School in India”. Could you tell us something about your role model(s). Self-made entrepreneurs, artists, writers, innovators – I love intensity, truth, passion and commitment to whatever you believe in. In terms of role models I celebrate ‘naughtiness’ in any form, revolutions in thoughts, processes. I admire the rogue spirit that stands up in public and asks us to reflect on why we are here and what we can do better. In movies, stories and life, people who make us see the truth and inspire us to best we can be, move me profoundly. In your website, goingtoschool.com, I see an awards section filled with too many of them to be listed here. And now you are TED Fellow too! Congrats. Which was the largest hurdle that you had to face on your way to where you are now? Did you take risks at instances? There were so many hurdles: first was whether or not one children’s book could really change the way children ‘see school’ – there were so many people who just did not see that it could be important – people could not see what we were going to do until we had done it because there was no prerequisite, there was nothing like it that came before. The largest hurdle we had to overcome is the same one we still have to overcome today – justifying that independent, beautiful stories for children should be made for kids from low-income groups, whether these stories (before they are made) are worth the investment of excellent artists, graphic designers, directors, musicians – the investment of money, time, vision – while our projects are a work-in-progress we always face this hurdle, as soon as we are done, everyone says, “ah I see, I understand” because the ‘value’ is visible, it’s a dream for children made material in our world. Yes, I take risks all of the time. It was easier to take risks when I was one person making a book – then I could join with other people – Kamath is an amazing artist, Nitin a super photographer – now to take risks with an organisation is harder – there’s more at stake, but I work with an incredibly talented and dedicated entrepreneurial team, and we remain small, and somewhere along the line we all agreed that we would rather always do something new, than repeat what we did before, even if that means it’s harder to convince investors, supporters, foundations. That was great. I’m sure you have a great team working with you. I would like to congratulate them as well, since the awards the organization received (and now, you receiving TED fellowship) also stands for what you believe in and the team that supports you. You started with “Going to school in India”, then “Girl Stars” and latest (I sincerely hope it’s not the last) “Be! an Entrepreneur”. Can you tell us something about when (year) & how each of these initiatives started and took shape? Going to School in India was the first, and it was released in January 2004 – but I started traveling to visit schools and talk to children, with Nitin Upadhye, the photographer – supported by the Bharti Foundation in 2001. But we really count ‘going live’ from 2004, then we made Girl Stars from 2005-7, and since 2008 have been working on Be! which will be ready next year. You (and your team) have gone from success to success. If I may ask, what is the next stride you are planning to take? We have a wacky new series for children we are seeing if we make real – otherwise – we have a chance to go to the other side of the world, Mexico, Brazil and Argentina! If possible, can you give us a brief idea about the “wacky new series for children”? You grew up in England, Canada, the USA… how did you choose to start the project in/for India? Which was the best moment during the course of this wonderful journey? For me, India is about the power of story to change reality – so there have been many stories, many moments, I can’t really choose one. But there is something ongoing that I often come back to in my mind – for me the journey is about the power of individuals choosing to believe in a story so passionately (a story larger than themselves) that together, they make it come true. Today, we are an organization of 10 people, committed to making mass media to transform children’s lives. We face incredible challenges, of course we do – everyday our ideas fall apart and are reassembled again with the belief that it is important to tell beautiful stories to children in India. We tell stories to children about how they can use their education to transform their lives, in the hope and belief that one day – their stories too, will come true. If you could give one tip to all the future “Lisas”(entrepreneurs for a noble cause) out there, what would it be? Make real what you believe in, and of course, never give up. Lisa’s journey began with just one book, one story. As an individual, she had a dream, saw the change that was needed and worked (and is still working) to bring about that change. Like she says “Make real what you believe in, and of course, never give up”. There will be more interviews of TEDIndia Fellows published here. You can see their profile here and let me know if you have any questions for them.